Jennifer Bornstein, Sunset Boulevard west of Martel Avenue, Los Angeles, February-March 2010. Part of "How Many Billboards? Art in Stead" temporary project organized by the MAK Center for Art and Architecture. "The fragmentary words "The End" are projected solemnly across the muted darkness rendered by Bornstein's meshwork of crosshatches signaling celluloid's imminent demise in today's digital environment. The words and gothic type reverse engineer the technological progression of the history of media. Film's death knell is delivered in the even more antiquated process of copper-plate etching. Bornstein's font choice also underscores typography's signficance within the history of Conceptual Art." 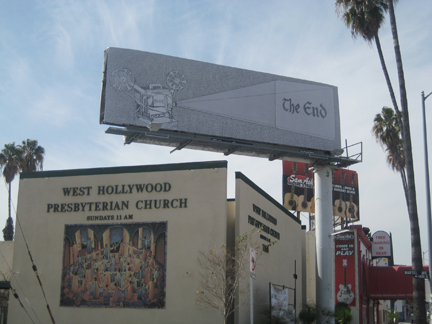 - text from a longer description by Gloria Sutton, http://www.howmanybillboards.org/, accessed 03/2010.